NOTE: This post will be revised if responses are left offering my suggestions for ways to improve or expand it, or as readers show me places where I’m wrong. So please, go nuts on telling me about that time you got way too deep into looking up some arcane fact of Medieval history related to this topic. I want to hear it and include what you found. Update: Here’s an example of how economic history can inform us about a fantasy world. On the heels of my two posts critiquing the realism of Westerosi population geography, I’ve gotten requests from lots of people for more general resources on Medieval population geography. As it happens, I am not a real expert on this subject (as I am in, for example, cotton trade or modern population geography). So all the advice I can give is based on my own self-directed research. That said, I do think that improvements can be made on the leading resource currently available on the web. Specifically, the page called “Medieval Demographics Made Easy” is widely used and cited, and forms a basis for lots of free “generators” out there that will randomly assign values for an imaginary world or realm. However, I’m pretty skeptical of some of the figures that MDME provides. I’ll follow the same pattern as that page, and try to offer some more informative estimates. How Many In That Kingdom? MDME gives us a wide range of possible population densities from 30 people per square mile to 120. The cap of 120 is based on the 14th-century population of France, which may have been over 110 people per square mile. Let me explain that “may.” First of all, we need to keep in mind that “counted population” is not necessarily “sustainable population.” Premodern population levels were far more volatile than current population levels. Famine, disease, hard winters, and the constant menace of war, banditry, or exploitive political regimes meant that population declines were far more common than in the modern world. With agricultural yields and surpluses far smaller than in modern times, much of the population was only one bad harvest away from serious hardship, or even outright starvation. On the other hand, a long period of peace and good climates could still yield modern levels of population growth, since birth rates were very high. Essentially, premodern societies have very erratic death rates. This means that we can’t speak of a truly “Medieval” population level. Population in 800 is not population in 1000, which is not the same as in 1300, or 1317, or 1450. Population could change by huge amounts in a short period of time, especially a change downward. Upward level-shifts were also possible if whole people groups migrated together, such as in the successive steppe peoples who arrived in Europe. But no matter what level you choose, 30–120 is not a plausible range. Take the estimated populations of modern European countries from 1000–1500 AD, and divide them by their land areas. You’ll find the highest population densities not in France, but in Belgium and Italy. Belgium peaks at 127 people per square mile in 1500. It is also the only European country to break the 100 barrier. France has around 36 people per square mile in 1000, and peaks at about 68 in 1300. Meanwhile, Scotland has 4–8 people per square mile. Sweden and Norway have 1–4. England and Wales have 11–30. Italy has 60–95. In other words, population densities below 30 people per square mile are very plausible, while population densities about 100 people per square mile are not likely for a large country. Curiously, I do find that the tiny Caucuses country of Georgia scored about 270 people per square mile in the 1200s, but I think there must be an error there; probably I’m using the wrong estimate of land area. So how do you know what density is right for a given setting? Well, we can set up a few rules. First: low density areas should not have large urban clusters. Medieval Sweden, Norway, and Scotland are decidedly rural, indeed nearly tribal societies. If you want vast empty spaces for your setting, then you should have few or no cities, and semi-tribal political organization. Centralized power should be rare. Society should be highly militarized. Total army sizes may be small because it’s hard to get everyone working together, but individual communities should be able to mobilize comparatively large shares of their populations. We should be thinking Viking raiders or steppe nomads, or isolated farming communities and fishing villages. On the other hand, if you do want to have some big cities like Paris, Rome, Seville, Venice, Munich, or London, then you may need higher population density. For highly urbanized settings, I’d recommend a minimum density of 20 people per square mile. England and wales had 20 by 1300, and England alone was probably more like 22–25. Spain and Portugal had about 35 by 1000 AD. That said, high density does not necessitate large cities. Many rural parts of Europe still had high densities: Denmark was over 30 from 1000–1500, mostly due to dense farmlands, not large cities. Switzerland was in the 40s by 1300, and stayed there, again mostly because of farming towns, not cities per se. On the other hand, densities over 60 people per square mile probably do necessitate major urban clusters. Examples include Belgium, the Netherlands, Italy, France, and Germany, all of which had serious urban communities (especially Italy and the Low Countries). We can also loosely associate maximum densities with technological achievement. Now to be clear, there could be low-density, high-tech areas that benefit from technological spillovers, but broadly speaking the technological threshold for a setting should be set by the highest-density realm or region. So in 1000 AD, our highest-density areas are Italy and Belgium, both with under 60 people per square mile. We should be thinking of a diffuse political society, limited industrial capacity, limited resource extractive capacity, lower agricultural yields, and probably fewer specialized skills. By 1450, max densities range from 110 in Belgium to 90 in Italy to 74 in Germany: so we can expect a substantive jump in continental technology, allowing more things like plate armor, large armies, specialized skills, large universities, etc. The most important technology is agricultural technology. This is what determines everything else, along with, to some extent, infrastructural technology. Everybody likes to focus on arms and armor, but plows, irrigation, seed varieties, crop rotation, and other yield management technologies have a far larger impact on society. They determine the size of the population, its density, its political potential, its capacity for urbanization, etc. Without surplus food, specialization into other trades, and therefore the industrial base required for high-Medieval armies with plate armor and large cavalry contingents and organized infantry, is not possible. Without surplus food, population does not grow, and casualties cannot be replaced. Importantly, large population declines due to plague or war create their own food surpluses, leading to post-war or post-plague population booms. How Many In Those Walls? MDME does much better on cities, suggesting that most “cities” are in the 8000 to 25000 population range. This is correct. For example, in the Byzantine Empire, probably the only city with over 30,000 people after the initial Arab conquests was Constantinople. The other major cities like Ancyra, Trebizond, Cherson, Thessalonica, Athens, Ephesus, Carthage, Smyrna, and Syracuse were almost certainly under 30,000 people, probably under 20,000. This interesting paper finds that, in 1300, Europe had 210 cities with consistent populations of 10,000 or more. The 92 largest cities constituted 3.3 percent of Europe’s population, or about 2.6 million people out of 79 million total. If we assume the remaining 118 cities had, say, 12,000 people apiece, that gives us 4 million urban-dwellers, for a total urbanization rate of 5.1% in these 10k+ cities. The largest city in Europe is Constantinople, with around 50,000 to 500,000 depending on the exact period. In 1300, when Constantinople was in decline, there were just 5 cities over 100,000 in all of Europe: Paris, Milan, and Grenada at around 150,000, and Florence and Venice at around 100,000. Meanwhile, there were 205 other cities over 10,000. How Many Cities and Towns? MDME also gives some plausible guidance for the number of cities and towns and their sizes, offering some dice-rolling tricks that could be easy for D&D DMs to use to build a campaign setting. But let’s get a bit more detailed. Europe (not including Russia) had probably 79 million people in 1300, in an area of about 3.93 million square miles. That gives it a population density of about 20 people per square mile. We said there were maybe 4 million urban dwellers, so that gives 5.1% urbanization. We also know that 92 towns had 2.6 million residents. Of these 92 towns, just 5 of them amounted to 650,000 people. Those 5 we’ll call “Large Urban.” Then we have 1.95 million in the other 87 large towns, average city size of 22,000 people. Then we have another 1.4 million in the remaining 118 cities, average size 12,000 people. So less than 1% of the population lives in the 5 “big cities” that could plausibly produce intensive specialization of skills and advanced tertiary industries. Another 2.5% live in good-sized cities that could definitely serve as centers of political power and some real economic power; there are 87 such cities. Finally, 1.8% of the population lives in smaller cities that are essentially market towns with some extra semi-skilled trades and services, as well as likely administrative or military hubs. Meanwhile, 95% of the population is rural. The number of tiny villages and castle-towns is almost certainly vast. Another 4.4% of the population resides in towns of 5000–10000 people. If we assume average population of 7,000, that means about 460 of these towns. If we then assume that there are probably at least 3 villages of 1000–5000 each for each of these market towns, average population of maybe 2,000, we get another 3.5% of the population. And if every village has maybe 5 hamlets of 100–1000, average population 350 or so, that’s another 3.1% of the population. Which still leaves us 84.3% of the population living in communities of under 100 people. Now I’ve probably underestimate the village and hamlet population, which means there are actually vastly more of these sized settlements: and even my low estimates gave me nearly 7,000 hamlets and nearly 1400 villages. The point is, this is way too many places to name. For a world-builder deeply concerned with realism, there are going to be way too many towns and cities for you to be able to put any flesh on their bones, or maybe even give them names, unless you use an automated name generator. Thankfully, history and magic can help you. If you can use some kind of magical or technological quirk to boost agricultural productivity, then you can boost urbanization. Or, if you can drop in some historical event that discourages villagization, you could boost the urban population at expense of the rural, at least in the short-term. Arab raids into Anatolia probably had this effect in the Byzantine Empire, and Viking Raids along the North Sea may have had some similar effect. On the other hand, if an area is regularly pummeled by large, organized armies, there should probably be less urbanization, as cities make sweet targets. If you’ve got a long-established administrative state, you can probably boost the city sizes. But if you’ve got recent conquest by barbarians, you probably need to reduce your urbanization rate. Where Are the Cities and Towns? MDME briefly mentions town locations: wherever there is traffic. This is partly true, but incomplete. One piece of realism that Tolkien got spot-on in Middle Earth is the location of cities, though of course his urban/rural balance is fairly preposterous, and intentionally so, as he was mimicking the ethereal landscape of the Kalevala. 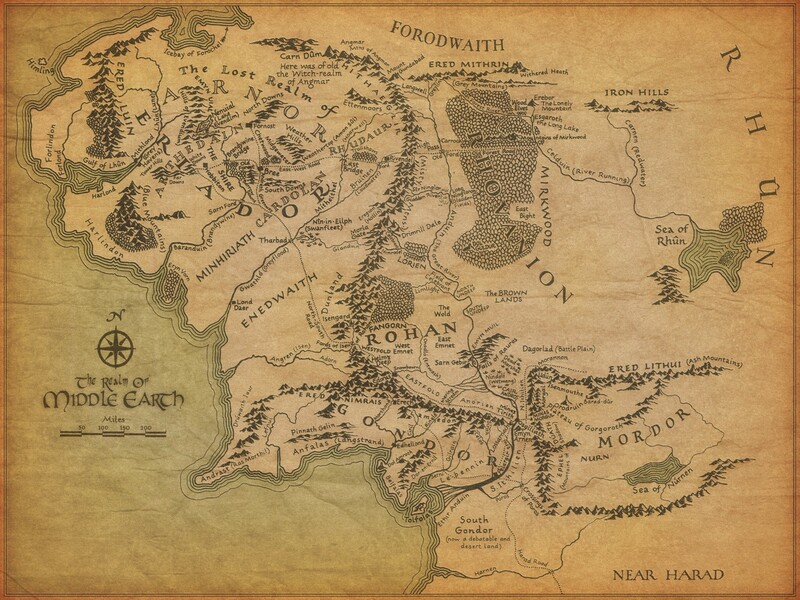 What were the major cities of Middle Earth before the decline of Arnor? Well, Osgilliath was certainly the biggest. Where is Osgiliath? It is near the “head of navigation” of the Anduin, a huge river facilitating trade. The “head of navigation” simply means “the furthest up a river potentially seafaring vessels can go.” The port city of Pelargir is further down the coast, but still nowhere near the actual delta. In the north, the largest city is Tharbad, just below the Swanfleet. Tharbad is also at the head of navigation of the Gwathlo River. Its proximity to a marsh is a bit odd, but we can guess from the pleasant name this marsh is not too horribly filthy, not like the Midgewate Marshes. Down the river from Tharbad is the old port city of Lond Daer at the delta, and north is the old land of Rhuduar, which had no major urban center. Further north, we get Mithlond, right on a major delta. But this delta cuts through large mountains, and is in a somewhat colder climate: it seems likely it’s something more like a Scandinavian fjord than a classic river delta. Meanwhile, the successive inland capitals of Arnor and Arthedain, Annuminas and Fornost, only persist as long as political power persist, and that power is constantly handicapped by geographic isolation from Rhuduar and apparently dynastic rivalries with Cardolan. We do get a small town of Bree with maybe a few thousand residents around a crossroads, and at the Long Lake in the east we get a city that’s clearly situated around a confluence of rivers connecting 3 key trading zones (the Lonely Mountain, the Greenwood, and Dorwinion). But the key point is that no major cities are situated around a large river delta. This type of city location would be very rare for the simple reason that deltas flood, they silt up ports, they get filled with bugs, they’re surrounded by pestilence-ridden marshes, and sometimes they shift completely. The great cities of Medieval Europe were often coastal, like Constantinople, Alexandria, Grenada, Venice, or Naples, but were rarely situated on a major river delta. Roma was miles back upriver, served by the ports of Ostia and Portus. Alexandria was at a harbor well away from the Nile delta. Constantinople was along an estuary of the Bosphorus. London was well up the Thames. Paris was well up the Seine. Large freshwater deltas are not where you built a major city. You build it as far upriver as seagoing boats will go, if you’re connected to oceanic trade, or as close to fertile farmlands as you can if you aren’t. In this sense, Tolkien’s story of the decline of the Numenorean ports like Lond Daer makes lots of sense as they shifted from a maritime empire to more parochial, inland kingdoms. So as you design your imaginary world, don’t put your huge cities right on river deltas, or deep in the mountains. Put them at heads of navigation, with their size proportional to accessible farmland, concentrations of political power, the absence of disease and presence of favorable climate, the relative structure of nearby military threats, etc. Also consider how cultural norms impact city sizes: people with a religion that centers around temple-based corporate worship probably build cities more than people who worship in a more animistic or shamanistic style. What is the ethnic background of the ruling dynasty? Is their base of power urban? Although they were a small portion of the population, Medieval cities were hugely important. Clusters of skilled trades were extremely rare in the Medieval period: so controlling one of the few major cities that possessed large-scale ironworks, or a good shipyard, or an organized financial sector, mattered a great deal. Well-fortified cities could also withstand sieges and project power, providing dynastic security. Furthermore, rural populations were often difficult to control, tax, and conscript, and could form a base of population for provincial lords or commanders to rebel. Urban populations were easier to manage and directly sway, and so often commanded outsized influence on their host realms. I have no beef with the MDME section here, as I honestly don’t know much about the exact composition of Medieval urban commerce. I think that they may underestimate the needed population to support some of these jobs, but I don’t think it’s a serious or specific enough issue to really criticize the numbers chosen. Well, except for military personnel. Here we need to really think about Medieval combat. It was hand-to-hand. I know that seems obvious, but that actually matters. It was also very specialized. It is easier to pick up a gun and shoot someone with it than to pick up a bow and do so. One of the advantages of firearms is that they are actually way easier to train people up to combat readiness. Rural Medievals might have some limited experience with a bow if, by some chance, they were in the local lord’s hunting party, or permitted to hunt on some land. But peasant archers are not actually going to be extremely common: bows are not actually that cheap to buy or maintain, and most peasants didn’t own much land on which to hunt. Swords likewise are probably not something peasants had lots of experience with. Edit: Many commenters have pointed out that peasant-archer companies appear in many places throughout Medieval history. True! When lords needed to recruit as big an army as possible, or were cash-strapped, or simply couldn’t command many knights, they would indeed raise peasant levies, which often meant archers. The differential in combat power a peasant could provide as an untrained archer vs. a semi-professional foe was far smaller than as an untrained footsoldier vs. a semi-professional foe. Untrained infantry existed, of course, but, given the option, using your lightly-trained troops as archers is preferable. They are less likely to face hand-to-hand combat which could induce panic and flight, so pose less of a risk to the army. They are, on the margin, more likely to have some archery skills than any real talent with a blade. But we should be clear that it is very rare that peasant archers will prove decisive in battle. The classic case of English longbowmen proves my point in some sense: the archers of Agincourt were not untrained peasants, but largely professionals or semi-professionals. And even then, England’s ability to raise these troops arose from a state-supported and -mandated practice of domestic archery after the Assize of Arms of 1181. That is, peasants did not naturally acquire the skills necessary to be functional military archers: the crown had to exert effort to create those skills. Really, the only weapons we can expect rural peasants to be even semi-proficient with are polearms and axes. For shields we’re probably talking wicker or a few boards. Now obviously a lord could provide his underlings with equipment, but these guys might not really have any idea how to be effective with that gear, and swords and armor are really expensive, so maybe you don’t want to give it to the serf who may flee and get captured. Or worse, maybe he’ll turn on you! Edit: Many commenters have complained that the archaeological record here finds a lot of more advanced equipment for men who were probably lightly trained. However, most of this archaeological evidence dates to the late-Medieval period. The later you go, the more urbanized you get, the more technologically advanced, the better the equipment provided to common soldiers will be. However, thinking of the broad Middle Ages as 500–1500 AD, most places and times in that window will not see untrained soldiers being well-equipped. In other words, we shouldn’t think of Medieval peasants as combat-ready. If and when a peasant army mobilized, it was probably very lightly armed and armored. Sponsored men-at-arms were probably better equipped and trained, but still not “professional soldiers” as we think of them today. Only the rare knights were professional troops in Medieval Europe, and even then we should take care to recall that they were cost-constrained in terms of equipment as well, and had to manage their estates alongside training for war. We do find some instances of genuinely professional troops: Saxon Huscarls, the most elite knights, some mercenary companies, Charles Martel’s soldiers, the Byzantine Tagmatic troops and, to a lesser degree, some of the thematic armies. These soldiers generally cut less professionalized armies into tiny bits pretty quickly. A disciplined corps of mounted knights could pretty reliable shred a peasant army several times its size. A well-led Byzantine force could do the same. The Battle of Tours was essentially the first time Arab armies encountered an even borderline professional army anywhere in Europe, and they lost, and then slowly lost more and more over the next thousand years. Troop quality was vitally important, to a degree hard to understand today. Troop quality was also hard to change. Most Medieval states had limited physical capacity to organize disciplined training, so the only “training” armies got was actual warfare, which, obviously, results in some of your soldiers dying, so its hard to keep up. Likewise, equipment was expensive, and the ability of a pre-urban state to replace lost gear was limited. Capturing a stockpile of weapons and armor could appreciably alter the balance of power provided the conquerors knew how to use the new equipment. But there’s also the question of culture. Marching your army out every summer to fight as a training exercise gets unpopular eventually. Few people willingly hurl themselves into battle every summer, so Medieval battles were often inconclusive, with both armies unwilling to launch themselves full force into the battle. The exception is in areas where combat was compulsory. The Armenians on the Byzantine-Arab border were perpetually being invaded by one side or another: it’s no surprise they formed the core of the Byzantine army for centuries. The Vikings had a society torn by near-constant local warfare and violence, meaning the number of men with combat experience was quite large. The Mongols, likewise, had a culture that created soldiers. Frontier, exposed, tribal, frequently-invaded, and less settled people make better Medieval soldiers. The only way to beat these natural warriors is to have a well-funded, well-reinforced, well-led, high-morale professional army, which is very rare in the Middle Ages. How could the low-population Vikings conquer so much of Europe? Because rural Europeans weren’t very military competent, and professionalized armies were rare. The high level of violence within Viking society made them far more powerful soldiers than their numbers would suggest. We can say the same of all the various steppe peoples, of the early Arab conquests, of the Armenians, of the Germanic barbarians who toppled Rome, etc. The balance of power only shifts away from “high violence societies” as agricultural technology improves, enabling larger cities, enabling more disciplined and well-equipped armies. In other words, when you consider Medieval armies, you don’t just need numbers. You need to know how those soldiers were raised. Whether or not they were going to be optimal soldiers was partly determined the day they were born, merely by where and to whom they were born. In other words, without a consideration of ethnicity, you can’t reasonably consider the relative power of two armies. And if one side is full of people who’ve been fighting and killing since they were old enough to swing a sword, then the other side had darn well better have a full-time professional army with a good commander and recently-paid wages. How many fortified places exist in a setting is largely historically-contingent, and hard to establish by a formal rule. But keep in mind some key factors. If a castle is abandoned, there should be a reason why it was abandoned. Fortifications are extremely expensive to build. If fortifications are abandoned it should probably mean the area has seen a very long period of peace, or else an extraordinary population decline. So don’t put abandoned castles along a violent frontier. Nobody abandons frontier castles. Also consider the type of fortress involved. The only reason you invest the time and money and labor to build a big stone fortress is if you expect to win. That is, most Medieval sieges don’t go on for years: they go on for a few days or weeks, then the garrison is either relieved by an allied army, or surrenders, or a traitor opens a gate or something. So unless you think you can get an army out there to reinforce your fortress when it’s put under siege by neighbors, you’re not going to build it in the first place: because that’ll just mean you built a fort for your enemy. In other words, underdogs are not likely to have impressive border defenses. Rather, underdogs are likely to have clever means of hiding, or even hidden forts, complex beacon or information systems, spy networks, and maybe some fortresses deep inside their territory. Edit: Some commenters have objected here, saying instances of long sieges are common, and castles were often able to resist major attacks. Here, I think we have ambiguity about terms. Most medieval fortifications will not be “castles” as we think of them. Castles are expensive to build and expensive to maintain. Sure, a well-built and positioned castle might resist a large army for months at a time — most most fortifications aren’t well-build and positioned castles! They are fortified donjons, palisades, mixed-medium walls, mixtures of ancient and more recent construction, etc. A wide variety of fortification should exist in your setting, unless you have a specific reason to think all fortifications had a common origin: for example, if a large, centralized state built them all at around the same time. Other than that, understand the role selection bias plays. Many sieges were indeed long, not because most fortifications could withstand long sieges, but because when defenders see a large army coming, they abandon all the fortifications that can’t withstand long sieges! Most fortification is built with an aim towards countering smaller threats, or even making taxation and administration easier, rather than enabling a given hard-point to resist concentrated onslaughts. Where large, robust fortresses are most likely is when there are two large, evenly-matched states with long borders. If you want epic castles, you should put them there. Notably, many of the most remarkable castles we know of are Crusader-castles. Now small castles are common if there’s a large amount of local warfare: if local lords are always killing each other, then you’ll probably find some castles. Or if there are lots of small or mid-sized raids, then you’d expect a lot of castles. Or if locals know that any warfare well necessarily be a war-to-the-death, like for Crusaders in the Levant. But these castles would match the budget of their builders: probably small, and often seeking to minimize construction expense, meaning they’ll be built into natural defensive locations, or mix wood, earth, and stone defenses, or only be large enough for essential personnel. Castles large enough to host an army will be rare, and usually concentrated along major political borders or political centers. MDME does not talk about armies, but I want to take a second to talk about their size and logistics. Medieval army sizes are hard to pin down. Sometimes ancient writers will talk about armies in the tens of thousands, which seems hard to believe in many cases. The reason is simple: that large a body of troops is very hard to support. Certainly you couldn’t camp them anywhere. We know from those cases where we do have good information that large armies were often split up into columns many miles apart to enable them to live off the land separately, which of course made them vulnerable to attack, which of course disincentivized splitting up, which, in turn, discouraged fielding large armies to begin with. The First Crusade is a perfect example of this kind of dynamic. For much of the Middle Ages, raiding was an optimal military strategy throughout Europe and the Middle East, because it could (1) massively destabilize the opponent, enabling factionalism to expose his castles and cities to easy conquest where besiegement would have been difficult (2) yield a good income for the raider (3) avoid the need to concentrate a large army and (4) give soldiers combat experience while keeping them away from the homeland, where they could rebel, and consume local resources. Vikings and Arabs alike raided, but so did many of the recent steppe-arrivals like the Avars, Magyars, Bulgars, and Slaves. Even the Christian peoples of Europe counter-raided quite frequently into nearby enemy territory. Far more than pitched battles, the typical experience of the Medieval fighter was probably cattle-rustling, small skirmishes, and village-burning. Where large armies did exist, they were likely followed by a larger number of noncombatants than there were combatants. In the case of migratory armies like arrivals from the steppe or some Arab armies, we could see an order of magnitude more noncombatants than combatants, as whole extended families migrated alongside just a few soldiers supporting them. In other words, a large Medieval army should usually have large numbers of noncombatants. This in turn means a huge supply train, which is, of course, vulnerable to raiding and hard to move quickly if you have to flee after defeat in battle. This means, again, commanders don’t want to fight a pitched battle. The risks are too great. There is one fantastic exception: disciplined horse-nomads. The amazing thing about the Mongols wasn’t just their archery or their strategic skill, it was their speed. They had no baggage train! They could move like lightning compared to their peer armies. They lived almost entirely off the land pillaging as they went. The result is that their foes underestimated their strength. They saw 12,000 people in a column, and figured, eh, probably just somewhere between 3,000 and 8,000 are actually combatants; we can take’em! Because those are the ratios in the armies of sedentary peoples. But it turns out, when you fight the Mongol army they’re pretty much all combatants. It gets even more complicated. Armies usually campaign in the summer, when the roads were clear and some people could be spared from farms before harvest. So summertime armies could be fairly large, especially if deployed close to home by a popular commander, and especially if no recent wars have thinned out the fighting-age population. These armies might reach into the tens of thousands, at least for a few weeks or months. But again, many of these seasonal soldiers are untrained, undisciplined farmers who aren’t actually much good in the field. On the other hand, fighting in the fall could involve much smaller armies. Everybody was back home for the harvest. Except, of course, the professionals. So your autumn-army might be much smaller, but its actual combat strength might not be so greatly diminished. And in winter, you could hardly gather an army at all… but if somehow somebody did manage to gather an army in winter, then your divided foes might be easy pickings, a few hundred at a time. We also have to consider ethnicity again. Different groups would have different norms and practices regarding who should be sent off to war. This will impact the size of an army. Finally, we have to consider economics. Rural people aren’t great fighters, but city-dwellers are just pathetic. Urbanites probably aren’t even comfortable with a hatchet or a pitchfork, let alone a sword or a bow. Areas where there are good income opportunities other than the army will tend to have less military culture, and fewer “natural soldiers.” So if your setting is rich and prosperous, then armies should be small and highly professionalized: you have to pay people a lot to get them to join the army, and when you pay them, there’s incentive to train them. If your setting is poor and war-torn, then you may have larger, less professional armies, where natural soldiering skill is what makes all the difference. Edit: Some commenters have complained that Italian urban companies and other city militias contradict these claims. However, those are largely late-Medieval innovations, and indeed are exactly what I’m talking about: when you get rich, prosperous cities, you get surplus revenues that can be used to keep some people training for combat, especially in the high-violence setting of, say, late-Medieval Italy. Note also that this place and period saw a dramatic rise in the use of mercenaries. So yes, as we get into the more technologically advanced, economically prosperous, and urbanized late middle-ages, then we can probably say that lightly trained urban combatants start to matter more; but this is, in some sense, a shift out of the Middle Ages. Much of it coincides with the introduction of pikes, gunpowder, and crossbows, all weapons that served to end the age of the knight and fundamentally reshape society away from Medieval norms. How are these men being fed? Why doesn’t an enterprising subcommander break off his group, and form his own little kingdom? What season is it? How long can this army really be held together? How many of these soldiers are seasonal volunteers without much experience? What is the ethnic and cultural mix of the army? Is intra-army feuding likely? What physical barriers are in the army’s way? How long would it take the back of the line to realize it if the front of the line was hit by an enemy cavalry charge? How long would it take commanders to move units around in the event of a surprise attack? How large is the camp for the army, and how is it structured? If they’re attacked at night, will soldiers be able to find their officers? How will casualties be replaced, or will they? Is there a permanent recruitment and training facility? How many non-combatants are with this group? What are they like? If the baggage train is captured, how will the combatants respond? Will they go on fighting, or surrender? Do the army’s commanders have any actual experience leading a military force of this size before? MDME also doesn’t discuss navies. But suffice to say, Medieval navies aren’t huge. The Byzantine navy probably never had more than 400 ships after Justinian’s dynasty ended, and after the Arab conquests, probably rarely more than 200, and never more than 120 in one place. The “Great Heathen Army” that conquered half of Anglo-Saxon England probably had less than 100 ships to ferry it over to England. Of course, the smaller the ships, the more you can have. If we’re talking about Polynesian canoes here, sure, your kingdom can plausible have hundreds or thousands of such boats. But if we’re talking real full-sized Medieval warships, a significant fleet will be measured in the dozens, and a huge fleet will have around a hundred or somewhat more. So, for example, we do get some accounts of naval battles involving the Scandinavian states where both sides have well over 100 vessels, but they’re using much smaller ships. Now, there are some exceptions to this. England and France both appear to have had navies in the hundreds or thousands of ships by the 1200s, and William the Conqueror probably used about 700 ships to sail across the English Channel. But of course, there are some caveats here: first, we’re not sure the quality of all these records, and second, many of those ships were not warships. Many would have been merchant vessels hired or commandeered for the exigencies at hand. Furthermore, there would be a mixture of larger and smaller vessels involved in these fleets. So broadly speaking, if you want to give a figure for warships, consider that very large realms with millions of residents (though admittedly realms not deeply committed to maritime superiority) generally fielded a few hundred vessels in their entire navy, tops. Smaller realms probably could launch a few dozen. For realms deeply committed to maritime superiority or with large merchant marines, larger navies are possible, but are likely to include a mixture of ships, most of them being supply vessels or other noncombat ships. Check out my Podcast about the history of American migration. If you like this post and want to see more research like it, I’d love for you to share it on Twitter or Facebook. Or, just as valuable for me, you can click the recommend button at the bottom of the page. Thanks! Follow me on Twitter to keep up with what I’m writing and reading. Follow my Medium Collection at In a State of Migration if you want updates when I write new posts. And if you’re writing about migration too, feel free to submit a post to the collection! I’m a graduate of the George Washington University’s Elliott School with an MA in International Trade and Investment Policy, and an economist at USDA’s Foreign Agricultural Service. I like to learn about migration, the cotton industry, airplanes, trade policy, space, Africa, and faith. I’m married to a kickass Kentucky woman named Ruth. My posts are not endorsed by and do not in any way represent the opinions of the United States government or any branch, department, agency, or division of it. My writing represents exclusively my own opinions. I did not receive any financial support or remuneration from any party for this research. More’s the pity. People Move. I Ask Why.